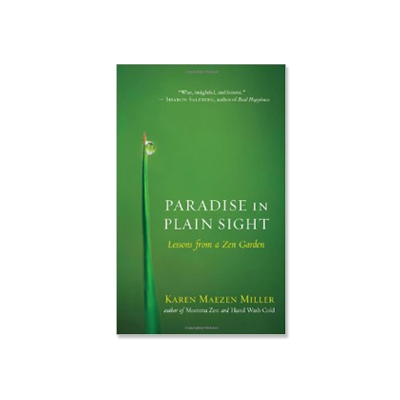 I recently interviewed author and Zen Buddhist priest Karen Maezen Miller about her new book entitled “Paradise in Plain Sight“. Karen and her husband purchased a home in the suburbs of Los Angeles called Sierra Madre, where an existing zen garden had been planted for many years, but was in desperate need of nurturing and care. Her book takes the reader on a journey of finding paradise right in your backyard a lesson that can’t be repeated enough. The best lessons are that paradise is always right under our noses, and we don’t need to keep seeking, changing or wanting more. This book isn’t really about Zen, and it is isn’t really about gardening writes Karen it is about the paradise we are all standing in right now. I throughly enjoyed my interview with Karen, and I know that you will love our podcast together. If you want to learn more about Karen, her other books and speaking engagements please click here to be directed to her website.